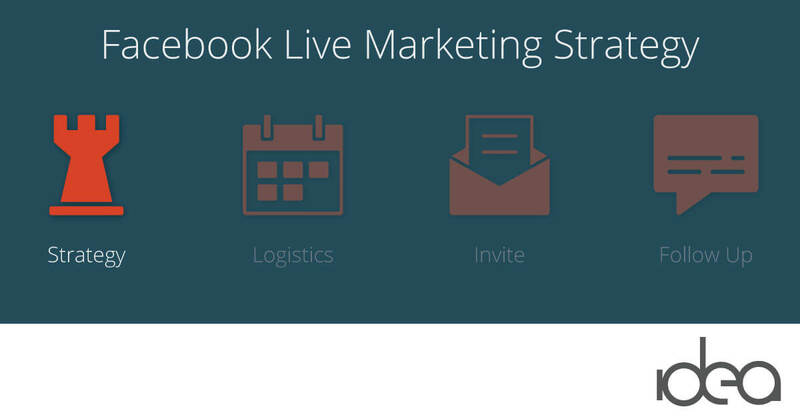 If you spend any amount of time on Facebook, chances are you’ve watched at least part of a Facebook Live video. In fact, two billion people have watched at least one broadcast since 2015. So, that means your customers are also watching. Facebook gives newsfeed priority to content that keeps users on the platform longer. And, according to Forbes magazine, “Viewers retain 95% of a message when they watch it in a video compared to 10% when reading it in text.” So, it makes sense for businesses to consider live video. However, like any channel, if you’re going to broadcast via Facebook Live, you should do it the right way. Here’s what that looks like. By thinking strategically about your goals, your target audience, and your messaging, you’ll begin laying a foundation for success. It’s ok to record Facebook Live or YouTube videos without a formal script. But, keep in mind that informal doesn’t mean unplanned. What topics will help your target audience get what they want or need? When and where will you broadcast? How will you invite your target audience to watch the broadcast? What topics will help our target audience get what they want or need? These questions can be answered by filming a product demonstration or recording a “how-to” tutorial that answers frequently asked questions. Approaching marketing strategy from this angle establishes your company as a helpful resource that understands its target audience and wants to share its experience. Alternatively, some companies use social media channels like Facebook, Instagram, and Snapchat simply to give a behind-the-scenes view into their company culture. If your goal is to highlight the people who make your company thrive, consider an interview-style Q&A format with key employees from each department. To capture the personality of your company, bring viewers into your next office potluck or birthday celebration. Often, it’s content like this that potential employees seek out when deciding whether or not they can see themselves working with you. So, if you can get your employees on camera, be sure to ask them what they love about your company and why they love the work they do. If you take an audience-centric approach when planning your video strategy, you can expect to build a loyal base of viewers and drive more business from your efforts. Long-term marketing is much easier to manage with an editorial calendar that shows when and where you’ll deliver your content. 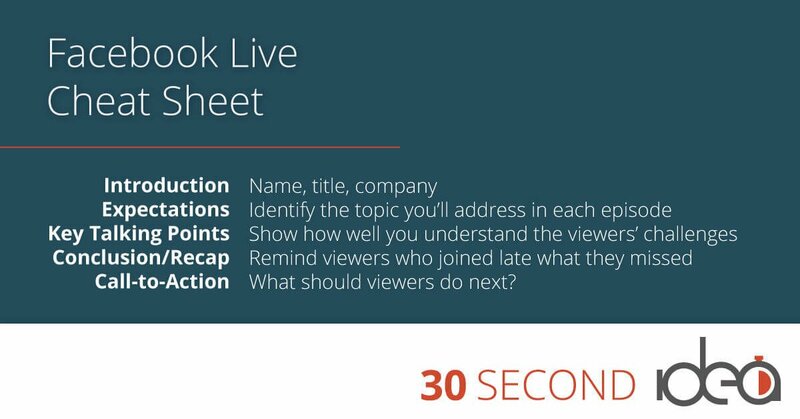 As you plan your Facebook Live video strategy, you’ll probably discover several more topics than you can (or should) cover in one broadcast. If that’s the case, you should create a long-term plan to broadcast on a regular basis. Scheduling your broadcasts in advance gives viewers a better idea about what to expect and when to tune in. Whether you broadcast weekly or monthly can be determined by the amount of time you’re willing to invest. Which option looks more realistic, given your resources? A long-term content strategy for video shouldn’t be about how many topics you can come up with, but rather a question of how many topics your audience would be interested in watching. Regardless of how often you decide to record video, you may have to test out a few locations before you find the right location. Don’t underestimate the importance of quality lighting or how disturbing (not to mention unprofessional) nearby noises can be. Check to make sure that you have a strong signal before going live. If you have a weak signal, your live stream will not work properly.WiFi is the best option, but if you don’t have access to wifi, a 4G connection is the next best thing. Earlier, we discussed the importance of maintaining an informal presence in your Facebook Live video. While that is the case, consider posting at least a basic outline card nearby to be sure you cover the most obvious basics. Call-to-Action – What should viewers do next? We’ve already said how important it is to create your Facebook Live content around your audience’s needs. Before you’re ready to “go live” it’s just as important to actively invite people to tune in by promoting your broadcast. Take the time to create a visual graphic that includes your photo, your company logo, and the topic you’ll address in each broadcast. Remember to include the day and time you plan to go live. People are more likely to watch if they know what to expect and when. Pro Tip: Consider scheduling a Facebook Live broadcast when you’re attending an industry event, like a trade show or a conference. 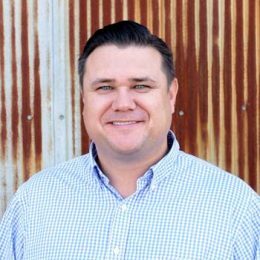 Getting to the day you finally go live can take so much effort–if done correctly–that most companies forget how important it is to follow-up afterward. When you’re engaged in delivering high-quality content your audience will love, it can be difficult to respond in real-time to every comment or question you receive. If you can respond during the broadcast, directly identify the viewers you’re answering. If you can’t, that doesn’t mean you should ignore them, though. Plan time within 24 hours to respond to as many viewers as possible. After all, reaching them was the reason you wanted to go live in the first place, right? The last step in the process is to evaluate the response to your video and to document the lessons you learned in each episode. How many viewers watched (each broadcast)? Did the audience seem engaged (did they ask questions or comment)? What would make you feel more confident or prepared next time? Did you see a noticeable difference in your page likes, visits, or website traffic to a specific call-to-action? Did it feel too long or too short? For a helpful step-by-step starter guide on How to Use Facebook Live, check out this great overview from Hubspot.